Keri Kerber: Keri is a fitness trainer at Fido Fitness where she has been a team member since October 2008. She has always had a passion for animals and has been working in the field of the past 7 years. She completed schooling in small animal massage therapies in 2006 and has also taken courses in holistic nutrition, as well as, animal First Aid. She has fostered countless kittens and puppies over the years, always having a soft spot for the puppies that were �bully breeds." She lives with her dog Lady a Pit Bull/Lab Mix, that she rescued 6 years ago, her kitten Milo, also a rescue, and other exotic small animals. She is currently working for a veterinary clinic, as well as an exotic pet store that also specializes in holistic foods. In her spare time she enjoys spending time with Lady outdoors where they can play with a tennis ball, go for a hike or other outdoor activities. Lynne Kolter: Lynne is a fitness trainer at Fido Fitness where she has been a member since July 2008. She has been very involved with animals since she showed horses as a kid. She also worked on a farm and has always owned dogs and cats. She has been in the veterinary field for over 15 years and has attained many certificates in the field including animal behavior and nutrition. She currently lives with her husband, two sons and their two dogs, Jack a border collie/lab and George, a miniature long haired dachshund. She is very active with the Save the Wolf campaign at this time. She loves the outdoors and enjoys hunting, fishing, archery, outdoor photography and hiking. 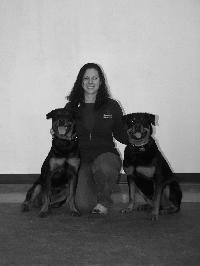 Kelli Lindstrom: Kelli is an assistant with the Paws-itivly Behaved K9s team and a fitness trainer with Fido Fitness. Being part of this organization gives her the opportunity to work with dogs, which is one of her passions. Kelli and her husband share their home with their two "kids," Bernie (German Shepherd) and Sasha (Husky/Shepherd mix). 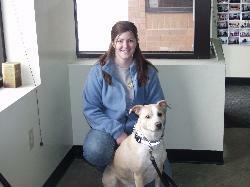 Kelli came to Paws-itivly to get a handle on some behavior issues that her dogs were exhibiting. She found through consistent training that a lot of "problem" behaviors can be turned around which has inspired her to continue their training. Through a lot of hard work, consistency and patience both Bernie and Sasha are certified Canine Good Citizens and certified Pet Therapy dogs. Besides being an animal enthusiast, Kelli has a Bachelor's degree from UW-Whitewater and works as a secretary in local elementary school. 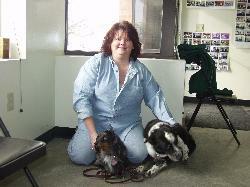 Mary Ann Richards: Mary Ann is an instructor with Paws-ivitly Behaved K9s and a fitness trainer with Fido Fitness. She has been associated with the facility since 2004 when she began taking her first female Rottweiler puppy, Keela, through training. Keela is now a certified Canine Good Citizen who hopes to compete in obedience and agility trials soon. Mary Ann has a Bachelor's degree from Beloit College where she played college soccer and studied abroad in Africa. When Mary Ann is not concentrating on "dog stuff" she can be found working in the legal field on most days or enjoying time with her fianc� and her Rottweilers Keela and Charlie.